I saw it subsequently. I had three conflicting thoughts. I decided not to write anything once i saw the story however because I had so much time for his murdered daughter. 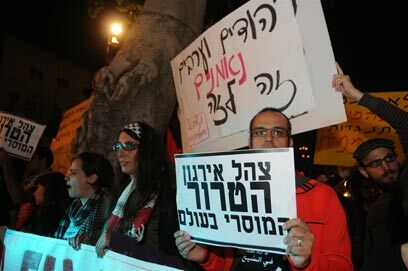 Was this a shallow insesnitive ploy to ensure alignment of Chabad in Israel with Charedi values vis a vi Medinat Israel? Or am I assuming more thought went into the reaction than really occurred? there is much to write and ponder about Chabad and its position on matters of the State of Israel, in particluar the obvious shift that has taken place in a very short time from the Rebbe Rashab , followed by the Previous Rebbe to the most recent Rebbe obm..
Pinchas, what are you talking about? Lubavitch is vehemently anti-zionist. You know that very well. If you don’t like it, get out. I was appalled when it was first announced that R Rosenberg had been given this “honour”, and wondered why the rabbonim did not react immediately. It’s obvious that the Rebbe would have ordered him to turn it down, and the Rebbe left it to the rabbonim to enforce correct behaviour in his absence. 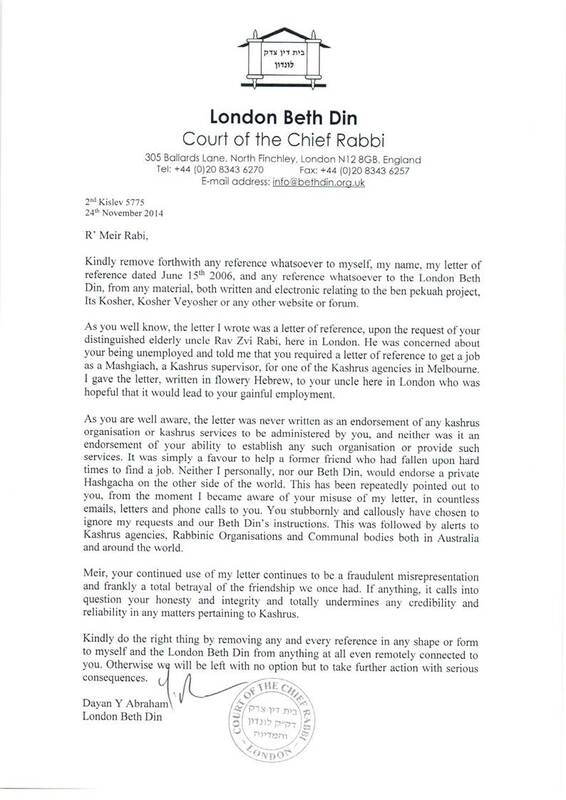 The letter, however belated, from such an impressive array of Lubavitcher rabbonim demands not only R Rosenberg’s respect but also yours as a self-declared Lubavitcher. By the way, Pinchas, I suggest that you ask anyone who was involved in Yeshivah in 1958 to tell you what pressure the Yeshivah was under to participate in the 10th anniversary celebration, and what pressure there was from within the Yeshivah board, and how and why that pressure was resisted. Milhouse, Chabad’s negative view of the State has not moderated. The last Rebbe didn’t call it “State of Israel” and he wouldn’t use the word Nasi for Shazar, that is true. It is also true that they saw no religious meaning in the creation of the State. That being said, unlike Satmar and their ilk, they most definitely have moderated their attitude vis a vis cooperation with the entity of the State albeit because it’s the most important Yishuv in the Jewish world. This is a change of Metzius, which didn’t exist at the time of the Rashab or the Rayatz. Tangentially, given that בפועל Chabad now does say that these are the times of the Mashiach, I wonder if there was ever a notion of an event, a happening, which signalled ראשית in the eyes of Chabad? On the matter of R’ Rosenberg, you will know of course that Chabad Central, who arguably deal with official policy were far more reserved in their comments, unlike the Chabad Rabonim in Medinat Yisrael. Chabad definitely had and have a policy of moderating their tone and dealing with the here and now. Given that the last Rebbe didn’t call the disestablishment of the State ח’ו as a condition of bringing Mashiach, and he subscribed the “we just have to polish the buttons” view (how many years does polishing take by the way?) I’d suggest that he didn’t agree with current other anti-zionists who say that the State needs to be dismembered before בן דוד comes. I know I am oversimplifying hsitory, and who knows, maybe the Rebbe did ask Israel Govt for guarantees if he encouraged settlement.. Surely the best way to change the political situation for Jews in Israel is not to pretend it isnt there, to shun it, but to engage with it. reminds me of the uneasy duality between learning Chol and Kodesh, and parnassah issues – looking at CHts today and most of the Charedi world, Jews are suffering as they forcing themselves back into Shtetl life in poverty and despair, doing unsavoury things to make a buck…. I don’t get it. A solitary individual Chabad woman opened a beauty salon for women in Williamsburg. Why does that call for a demonstration against Crown Heights as a whole? The demonstration should have been in front of her store in W’burg. Seems to me to be an excuse for these Satmars to express their animus towards Lubavitch. I doubt they would be particularly tolerant if the shoe were on the other foot, in fact, I strongly surmise that if a group of Chabadniks even tried to demonstrate in W’Burg they would be run out of town post haste and, if lucky, in one piece. I cannot believe the lack of facts and ahavas yisroel here. Firstly, the store that the Satmar Chassidim were protesting against was the one that a Crown Height’s entrepreneur opened up in Williamsburg. They were demanding that the lack of tznius etc that they claim is now in CH should remain there as it is harmful for their community. It has nothing to do with the fights between Satmar and Lubavtich. Please get the facts right before you voice your opinion! I just want to clarify what happened in Crown Heights. There is a beauty salon on Kingston Ave. that has many customers from Williamsburg. The owner decided to open a branch in Williamsburg. The people that came to protest were in fact Neturei Karta, as evident from the Palestinian flags they were wearing on their lapels’. They said that they have no issue with the salon, their issue is that it shouldn’t be a store-front (it she be in a basement). People in Crown Heights are still trying to figure out what these 5 guys wanted, are they the only five people that care, and why would they wear a Palestinian flag if they want people to listen what they have to say. Thanks Mendy, you’ve provided useful information. Not withstanding it, I still ask why this was a proper mode of protest, and I stand by my comment of Feh, and have added a secular Feh to the original post which is as bad if not worse. Then I would conclude that the protest against the salon was really a Trojan horse for them to get into Crown Heights to spread the real NK pro-Palestinian message. Best thing to do is to ignore them. Why do COL and other sites give them any coverage? This attention is what they want and only encourages them. This would be funny were it not so tragic. We are supposed to be the People of the Book, a ‘smart’ and inciteful people. These individuals have surely lost the plot. What is their motivation for this? They can bend so far (and stoop so low) as to show the face of friendship (???) to these villains, our sworn enemies. Yet, what would it take for them to bend a little the otherway and demonstrate just a little trust, understanding and consideration for their fellow Jews who don’t actually share some of their narrow mindedness. Think of the potential Kiddush Hashem and achdus that could be achieved! Realistically, do you have spell checker? We’re a smart and insightful people , not G_d forbid and inciteful people. More to the point, this whole “people of the book” nonsense is the way Moslems describe Jews and Christians. It’s not a Jewish phrase, and it never did refer specifically to Jews. It’s also somewhat offensive, because what it means is that in Islamic law Jews and Christians are placed somewhere between Moslems and idolators. Maybe it’s time for “all” Rabbonim to get together (might be hard) and put these NK nuts into Cheirim or whatever they would like to call it. And everyone is standing around watching them in the video! That should be doing “tzenius” – not genius. I hope u aren’t even remotely suggesting that street protests on internal matters of religion are appropriate and that you are not so deftly trying to deflect from these Neturei Karta to Crown Heights. Shame on you for calling them (the anti-beauty salon protestors) as Satmar. Please change your heading. It is moitzi shem ra and defamatory. Bamba, the story had been publicised as Satmar, but I take your point and adjusted the post. Notwithstanding that, only NK could live in Satmar Williamsburg and be tolerated by them to the extent that they are not expelled. Will these people be brought to either of the Satmar Rebbes or both of them, and be told to shut up? Are they a Satmar offshoot? Do you believe they are not influenced by and large by Satmar ideology? What else, pray tell, drives them to protest about a woman’s shop on the streets of Crown Heights and cause what I consider to be a Chillul Shem Shomayim? In this instance, the Israel signs on their frocks are paranthetical and not the issue. Their extreme Kanous is the issue. My charge is that they are not Pinchas. Does Satmar view them as an extreme albeit legitimate stream of Pinchas Kanous? All indications are they they do. Do you have some information to the contrary that you can share with my readers? Your title is still misleading and potentially defamatory. Satmar have clearly stated that NK are not them and they are not NK. “the Israel signs on their frocks” are NOT “paranthetical”. 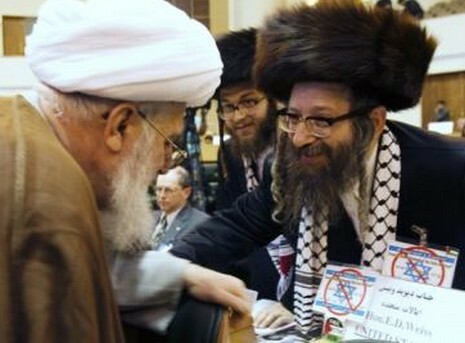 They prove my point that they are not Satmar. Ftr most of the NK live in Monsey. Not a Satmar enclave by any definition. You should not be mentioning Satmar at ALL in this post. Hmmm, Bamba, the title is “Don’t they have anything better to do?” not sure how that points to Satmar. I would assume that these NK’s live in Williamsburg, amongst Satmar, or are you suggesting that they live in Monsey and came into fight the battle for Williamsburg in Crown Heights? Perhaps you are also suggesting that NK wasn’t an offshoot from Satmar? By the way, do you know how big NK is in Monsey or Willamsburg? How many families approximately? Do they have their own Shule(s) etc? AFAIK the Rebbe did not have a positive view Chabadniks’ participation in street demonstrations of any kind. Seems a bit contradictory for frummers to conduct loud public demonstrations that garner media attention about the issue of tznios. Yes, there is a problem with tznios in Chabad. However, having ‘tznios watchguards’ , like the group in CH whose self appointed shlichas is to embarrass and harass women, or making loud proclamations in the street will not strengthen observance of tznios, or any other mitzvah. If the Rebbe taught us anything it is that Yidden must be brought closer with chesed and not gevurah. For example, those frummie rock throwers in Eretz Yisroel who force businesses to close on Shabbes by passing draconian laws, or by harassing or violently attacking store owners, accomplish nothing even when the store owners comply. The merchants do not shut their doors out of an inner commitment to Torah observance but rather, out of fear of reprisals. Inwardly they may deeply resent and may even hate the frummers for forcing their hand thereby pushing them further, not closer to Yiddishkite even while their shops are closed on Shabbes. The only way to strengthen tznios, or any other mitzvah observance, is through mekareving our fellow Yidden with ahavah for Torah learning and Hashem. This is so basic for any Chabadnik I am astonished that some don’t seem to get it. Somehow we must reach the women of anash and show them the beauty of the mitzvah of tznios so they willingly come to observe it out of their inner appreciation and desire to come closer to Hashem and not because they are being condemned. You’ve gotta be kidding? They wouldn’t go to any Rebbe or Godol. They would laugh in their face. By them there is only one type of godol and that are those that believe in their meshugas. The fact is that they are not welcome. E.g. when one of their leaders came to daven in the Satmar Bes Hamidresh in Manchester, the Rabbi of that shul told them to leave. Their children have been barred from certain mosdos. Etc. There have also been extremes, where their houses have been burnt down.. Thanks Ben. That’s interesting. In Melbourne, it would appear to me that Melbourne’s Adass Israel community is far more accommodating of their own NK extremists. I am not aware of any of them being barred, although I understand that there is so called tension between the mainstream therein and the extremists. I am not a member of Adass, but have contact and know most of them. I am not aware of anyone there being a member of nk, or of any nk members visiting there.